Easements in Indiana are commonly created by prescription, in gross, in appurtenant, or by necessity. An easement is a non-possessory and non-ownership right of one person to use the real property of another person for a specific purpose. The easement deed is the instrument in writing that creates the right. Additional easements, such as solar easements and conservation easements, can also be obtained in Indiana. A solar easement can be obtained for the purpose of exposure of a solar energy devise or passive solar energy system to the direct rays of the sun (32-23-4-2). A conservation easement is a non-possessory interest of a holder of real property that imposes limitations or affirmative obligations for purposes as outlined in 32-23-5-2 of the Indiana Revised Code. Conservation and solar easements are subject to the same conveyance and recording requirements as other easements in this state. An easement created after June 30, 1989 must cross reference the original recorded plat. If the real property from which the easement is being created is not platted, the easement must cross reference the most recent deed of record for that property in the recorder's office (32-23-2-5). 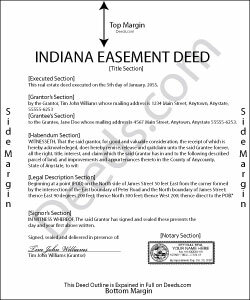 Just as with any other real property instrument in Indiana, an easement deed should be dated and signed, sealed, and acknowledged by the grantor. If an acknowledgement is not present on the deed, it can be proved before one of the officers listed in 32-21-2-3. Easement deeds can be acknowledged in the county where the deed is to be recorded, in another county in Indiana, or in another state, or as according to statute. If acknowledged in another county or state, the easement deed must be certified by the clerk of the circuit court in the county where the officer resides and must also be attested by the seal of that court (32-21-2-4). If acknowledgements are taken before an officer having an official seal and are attested by the officer's official seal, it will be sufficient without a certificate. If the certificate of acknowledgment is required, it should be written on the easement deed or attached to it and recorded with it (32-21-2-29). Unless the certificate of acknowledgement is recorded with the easement deed, the deed may not be received or read in evidence (32-21-2-11). Easement deeds will not be valid or effectual against any person other than the grantor, the grantor's heirs and devisees, and those with notice of the conveyance unless the easement deed is recorded within the time and manner provided by Indiana Statutes (32-21-3-3). An easement deed will take priority according to the time of its filing. Easement deeds in Indiana should be recorded with the county recorder in the county where the property is located.